This little plant flowers quite early (early March onward) and as it is quite small it is easily overlooked. 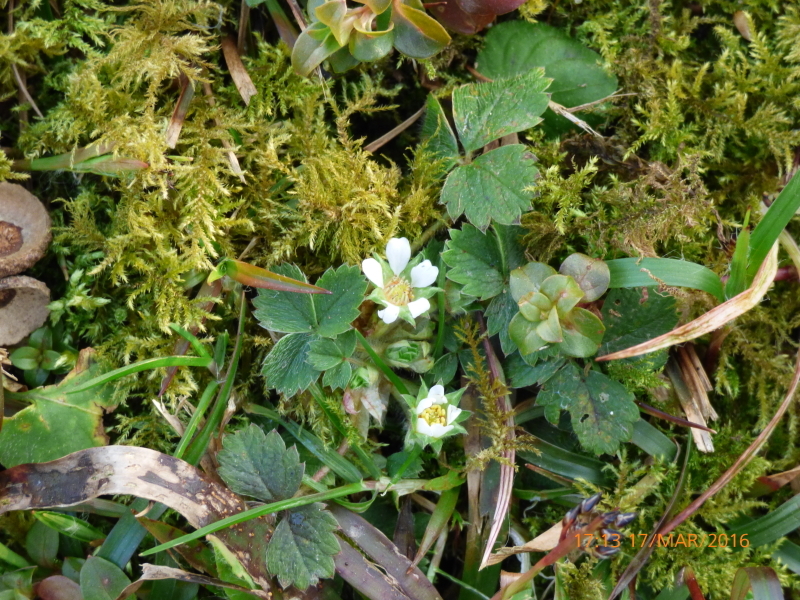 As you can see in the photo above it has 5 little white petals just like the Wild strawberry but the difference is that there is a gap between each petal, whereas the petals of the wild strawberry join together at the base, although they are not actually fused but there is no gap. The other difference is that the leaves are quite hairy, especially on the underside and have a definite bluish green appearance. Also if you look carefully the little point at the apex of the leaf is quite small, it is noticeably smaller than the points either side of it. Although the flower has 5 petals it has 10 sepals, you can see them in the photo above and the one below, they are arranged in two whorls, each of five. Obviously from the name they do not produce little strawberries, no little red fruits, the seeds are dry and brown. However I am not that impressed by the wild strawberries produced by Fragaria vesca, they are not that tasty and you need to spend ages collecting them in order to get enough to make a small desert, it is really not worth it, leave them for the wood mice and birds. This plants grows on the edge of woodlands on banks and dryish places, there is some growing on the top of the old dry stone wall that surrounds Ninewells wood. It is quite common if you look for it and flowers for some time, starting quite early in March and continuing on until May. Apart from that there is not much to be said about it…. small and inconsequential.